• Use Phasor Diagrams to Calculate Unknown Values. There are several ways of using phasor diagrams to find out important data about LCR circuits. 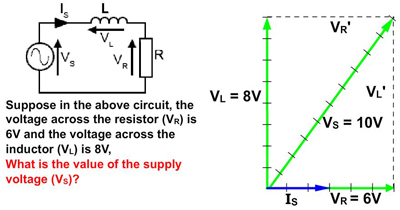 For example: "What supply voltage will be needed to ensure a particular voltage across the inductor in a circuit?" or "What would be the phase difference between the supply voltage and supply current at a particular frequency of operation?" and many others. Fig 5.4.1 is an interactive guide to introduce three different methods of using phasor diagrams to find some unknown quantities. Step through the three methods by selecting the appropriate START button, then click NEXT to continue. Once you are familiar with these methods you can choose the best one to solve any particular problem involving the values and phase angles of AC currents and voltages. To help you on the right track why not download our "Maths Tips" booklet, which shows you how to use your calculator to calculate angles and values using trigonometry functions and get the right answer every time. No scientific calculator? The "Maths Tips" booklet explains what you need and don´t need from a calculator. If you don´t want to buy a scientific calculator, you can always pick up a free one from the net. PC users can try Calc98 from www.calculator.org/download.html. Whichever calculator you choose remember that you should read its instructions to become familiar with the working methods you should use as these do vary from calculator to calculator.